Please read on for a comprehensive guide to enrolling at Mount Alvernia. Enrolments will not be processed unless this documentation is complete. A non-refundable application fee of $250 is payable, on lodgment of an Enrolment Application Form, to cover administration costs. A receipt of your application for enrolment will be provided in writing. All offers of places in the College will be made subject to consideration of the information contained in the Enrolment Application Form and an interview with a member of the College leadership team. Interviews will take place in Term 1 of your daughter’s Year 4. Parents will be contacted in writing to arrange a suitable interview time. Offers of placement will be made in writing early in Term 1 of your daughter’s Year 4, with the acceptance date being 22 March. On confirmation of enrolment, a holding deposit of $750 is payable to the College. This deposit will not be refunded if you subsequently cancel the enrolment of your daughter prior to her commencement at the College. The holding deposit will be retained by the College and will be refunded when all fees and charges have been paid upon the completion of Year 12 or earlier if the student leaves the College. A specific parent information evening is held in Term 4 of your daughter’s Year 6 prior to her commencement year. On the evening, parents will receive a package with all the information required to start school, including uniforms and the procedures for student orientation day and the new school year. We hold two student orientation days in Term 4 of your daughter’s Year 6. The first day is an opportunity for your daughter, with a small group of peers, to experience a college day as a potential Year 7 student. This day is not compulsory, but recommended. 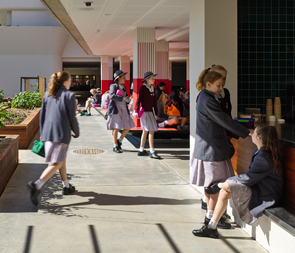 The second day provides a time for your daughter to be introduced to her Year 10 mentor, to experience a day as a Year 7 student at Mount Alvernia College, and meet Home Room teachers, as well as become familiar with the layout and facilities of the College. Applications for enrolment lodged after the application close date will be placed on the waiting list in order of date of receipt, regardless of enrolment category. Applicants on the waiting list are interviewed as places become available. In the event that this occurs, parents will be contacted in writing to arrange a suitable interview time. Applications for enrolment can be lodged at any time for entry to other than Year 7. Enrolment is subject to an interview with the Principal and places being available. A non-refundable application fee of $250 is payable, on lodgment of an Enrolment Application Form, to cover administration costs. The application should also be accompanied by copies of the documents as outlined in the Enrolment Application Form. For more information and a copy of our enrolment information pack, please contact Camilla Horn, Marketing and Admissions Officer.